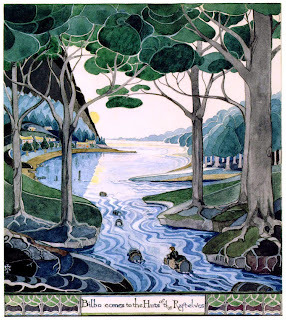 Anyone who reads my drivel on a regular basis will have gleaned by now that I am a Tolkien guy. I credit his work with awakening my interest in literature; I still love to read The Hobbit and The Lord of the Rings. I also like the Peter Jackson films -- I think he did as good a job as he could with most of them. Sure, I disagree with some of his choices, but I am open to the idea of interpretation: he sees it the way he sees it and he makes choices not only in the interest of the source material, but in the interest of making a good movie. That is the nature of the beast. I just saw The Desolation of Smaug -- the second film in the trilogy based on The Hobbit. The first film in the trilogy, An Unexpected Journey was actually my favorite of all of Jackson's adaptations, so far. While I enjoyed this second film, I think that (so far) it is the weakest of his adaptations. Smaug, the dragon himself, was awesome in the truest sense of the word. In the end, though, I don't think the movie captured the charm of the original book the way the first one did. This is tricky with a book that is really very much a children's book, complete with cute rhymes. Jackson had to create movies that linked to the more adult Lord of the Rings films and that wasn't an easy task. He managed to do that with the first film, but not with the second. Tolkien's illustration of the barrel escape. I think most artists try their best to do what they believe. I think Jackson made a good movie. I just think, on this one, he leaned more toward his own movie-making ego than toward making a true connection with Tolkien's magic. I had originally heard this was going to be a two-movie series. That would have made sense. Go see it, though. (I'm going to go see it a few more times myself.) I don't think Jackson is capable of making a bad film and it is truly entertaining. It is an action film, though. Don't expect "Chip the cups and crack the plates/That's what Bilbo Baggins hates." It ain't in there. I saw the movie today with my delighted ten-year-old nephew, and pretty much agree with your take on it. I suspect that the LoTR movies were such an all-encompassing experience for Peter Jackson that he now only knows how to make one kind of Tolkien movie, with a tone and approach that aren't quite suitable for the gentler, sweeter book he's supposed to be adapting. I did enjoy it—it's fun to dip back into Jackson's version of Middle Earth—and every so he strikes a humane, character-driven note that elevates this movie over most action-adventure spectacles, but it felt very padded, and you're right: it's not quite The Hobbit. For some reason, I couldn't even recall Tauriel from the book. I had to go back and read it again. There was no such love interest. It would have done the movie a favor to have left Legolas at the edge of Mirkwood after that most epic slaughter fest at the river. Alas, where would the new audience be without Orlando? I would've liked to see them develop more on the naming of Sting - the Spider's Bane (at least more than a simple "heh, shtiiing, that sounds cool'). I also disagree with the portrayal of Bilbo's behavior towards Smaug. 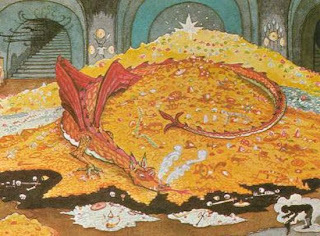 As I recall in the book, he mocked Smaug and toyed with him, only to be countered with the dragon's inflamed ego. It seems to be like all movie adaptations of books: a great film for those who haven't read the books, and a pretty enjoyable experience for those who have. Beyond that all, the only thing I disagree with (sort of) is that this was the weaker adaptation. I'm still trying to place my vote on which of the two so far was better. P.S. Don't forget about the lyrics! I especially agree with you about Bilbo and Smaug! That interplay in the book is great -- Bilbo is clearly developing into quite the intrepid adventurer and I don't see it in the film. And thanks for the reminder -- I ought to be shot.